Can I be honest with you and tell you something? I LOVE MY JOB! I love pretty much everything about it. My goal is to get everyone who works alongside us and helps us build our Culture of Care to feel the exact same way. I say all of this because I had a wonderful day yesterday at Sycamore Run, our 142-bed nursing home in Millersburg, Ohio. The team there is an incredible group and they are passionate about their residents and work really well together as a team. Having said all that, I found out a lot about what we can do better as a company to make them know they are appreciated and make them know that they are the key to our success as a company. I guess that’s why I say “I love my job.” To have an opportunity each week to work alongside our team throughout the state and get their feedback and suggestions, in an honest and real way, there’s just nothing better. Karen Woodring has been an STNA at Sycamore Run for 25 years. Quite simply, Karen is the salt of the earth. She has that confident and loving presence that makes your immediately feel at ease when you are around her. 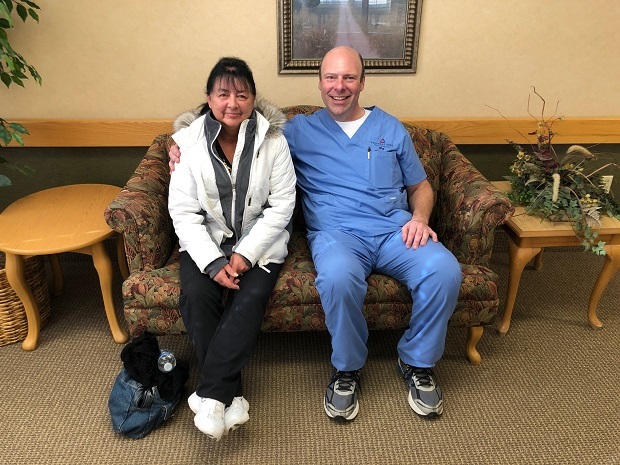 Kirk Hartline, the Administrator, said “If I ever needed taken care of Karen would be the type of person I would want.” Her interaction with the residents, fellow STNAs, nurses, housekeepers, and dietary aides was one of mutual respect. As we worked together, Karen would introduce me to other members of her team in the various departments. It was awesome getting to know everyone, hear their ideas, and learn each part of what makes the Sycamore team so special. While we were on break, a group of us had an opportunity to discuss things we were doing well as a company, and things that we could improve on. I walked away from our conversation feeling like I have another big important piece of the puzzle that will improve our company’s culture. All results, good and bad, are generated through our staff. It is our front-line staff that create the unique and memorable experiences for our residents and families. The goal of our leaders shouldn’t be to discover business issues on their own and solve them by barking orders to others. Rather, our goal as a company in our Culture of Care, is to use the collective power of our team members to seek out, prevent, and solve the root causes of those business issues. That happens in break rooms, employee meetings and hallway conversations. The location isn’t the important thing but rather our openness to honest feedback and our willingness to make things better for everyone. Culture guides discretionary behavior and it picks up where the employee handbook leaves off. Culture tells us how to respond to an unprecedented service request. It tells us whether to risk telling our bosses about our new ideas, and whether to surface or hide problems. Employees make hundreds of decisions on their own everyday, and culture is our guide. Culture tells us what to do when the CEO isn’t in the room, which is of course most of the time. Thank you, Karen and everyone at Sycamore Run, I had a wonderful day with you and am very proud of your commitment to caring for our residents. Thank you for your feedback and suggestions, I am taking them to heart and working on them as we speak.